Ever been on a plane? Back before the days of in-flight movies and fasten seatbelt signs, courageous men and women like Amelia Earhart dedicated their lives to realizing the possibilities of powered flight. If they hadn't taken to the skies, the idea of using airplanes for widespread transportation might never have gotten off the ground. So it makes perfect sense that you'd want to pay tribute by wearing one of these great-looking flyer's outfits! 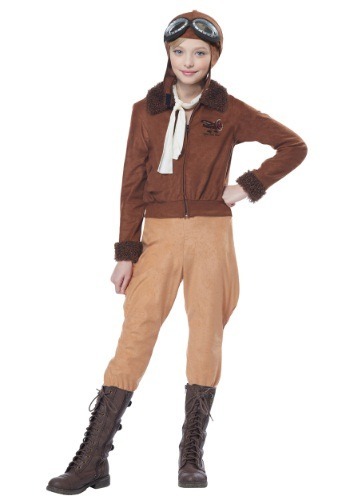 This Child Amelia Earhart Costume looks like it came straight out of the history books. The top is modeled on a leather bomber jacket from the 1930s, and the goggles and headpiece are reminiscent of gear worn by pioneering aviators like Ms. Earhart herself. Light brown breeches and a scarf round out the attire. We only regret that we can't include a bright red Lockheed Vega like the one she used for several of her most impressive flights, including her solo crossing of the Atlantic Ocean! As you probably know, Amelia Earhart's attempt at becoming the first woman to fly around the world ended with her tragic disappearance. But even though her life's work was cut short, she left behind an amazing legacy of courage and innovation that should continue to inspire generations to come. It just takes people like you to remind everyone what the true spirit of exploration looks like. So suit up, give those propellers a spin, and get ready to break some records!